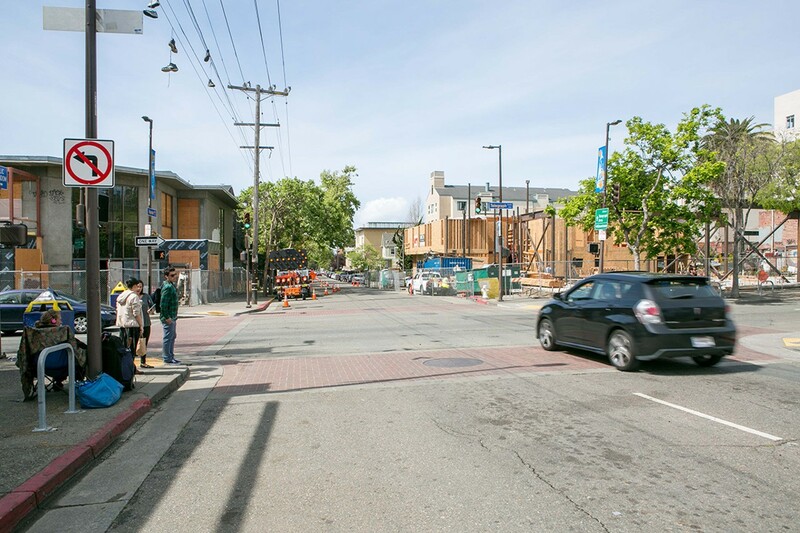 The eye-sore intersection at Telegraph Avenue and Haste Street in Berkeley. In November 2011, a five-alarm fire blazed through the Sequoia Apartment building on the northwest corner of Haste Street and Telegraph Avenue in Berkeley. The city's meanest inferno since 1991 left scores of tenants homeless and scorched Cafe Intermezzo and Raleigh's overnight. Only demolition awaited the building's charred remains. The next morning, employees at the flagship location of Amoeba Music, which was catty-corner to the fire, beheld what looked like a blast radius around their business. For merchants on the storied strip of Telegraph near UC Berkeley, it was another dark omen. That's because, before the fire, the intersection was already grim. On the southeast corner, the derelict Cody's Books building, once the anchor of a certified "Free Speech Zone," had sat mute and glum since 2006. To the north of Amoeba, a long-blighted empty lot sheltered trash and rats. After the fire, Amoeba became the intersection's sole tenant. With the Sequoia razed, the collegiate strip was a ruinous nexus for the homeless, catcalling guttersnipes, students, and a still-steady stream of music fans patronizing a couple of the biggest record stores in the country. The Cody's building, which Sarachan acquired in 2006, is the future home of Mad Monk, a proposed nightlife venue, retail space, and eatery. Speaking before Berkeley's planning commission in 2013, he described a restaurant called Commissar. In keeping with Rasputin's Russian theme, it would feature a novel take on soviet cuisine. Additionally, he promised a cafe and a venue, with nightly live music of varied genres — except techno — but including rap, as long as it was the conscious, didactic stuff, he explained, citing Tupac Shakur. Furthermore, Sarachan planned on selling media, with particular focus on vinyl records. He stated a goal of opening by year's end. That didn't happen, but statements from people familiar with the project indicate that Mad Monk will soon be finally arriving, though probably not like Sarachan said it would. To the commission, Sarachan emphasized a highly curated collection of vinyl, touting the "best assembly of records anywhere in California," culled from a deep stash, but a supplementary document to the city undermined his curatorial boasts. "Rasputin's will move all of its vinyl to [Mad Monk]," it read. Recently, the address for Rasputin's DVD section appeared in an online listing for lease. Employees close to the operation said that a tentative plan is in place to relocate the movies to Rasputin's basement, which currently houses the vinyl, and move all of the records to the Mad Monk complex. The listing stated that the building is available as early as May. In Aaron Cometbus' journalistic zine on Telegraph's book and record stores, The Loneliness of the Electric Menorah, he recounts how, in 1991, Sarachan foiled Amoeba's expansion. A developer planned to build housing on the northeast corner of Haste and Telegraph, which would have replaced a burned-down SRO hotel. Amoeba committed to expanding its store into the bottom level. According to Cometbus, Sarachan stuffed more than a million dollars into a suitcase and delivered it personally to the property owner, buying the lot out from under Amoeba and the developer. All of this is after he tried, unsuccessfully, to buy Amoeba's building. Marc Weinstein, once a Rasputin employee himself, cofounded Amoeba in 1990. As he said to me in an interview about Sarachan's brash purchase, "There are those who say that part of his motivation for buying the lot was that we were going to rent the bottom. What's more poignant is that he shut down the project and kept that lot empty for 25 years." Weinstein also emphasized that the City of Berkeley should share the blame for Telegraph's rut. He pointed to the relatively cheerier holiday decor in other districts as indicative of the city's disinterest in the area — and its reluctance to keep Sarachan's sprawling empire of derelict properties in check. Still, Weinstein continued, "The fact that we didn't invest in that space allowed us to go and open a store in San Francisco." Tellingly, Sarachan recently encroached upon that turf, too. In the new Rasputin location near Amoeba's Haight Street store, Weinstein explained, "[Sarachan] sells some of his new releases at cost as some kind of gesture to mess with us, but by adding a record store to Haight Street, he's only helped us be a destination." Such one-upmanship is familiar: When Amoeba started offering students a 10 percent discount, Rasputin introduced one that goes to 11 percent. Weinstein, like most people on Telegraph, supports Mad Monk's proposed nightclub component. The area, he said, must morph back into an arts district. About Sarachan's vinyl inching closer to Amoeba, Weinstein spun it as a boon: "Whatever his motivations are, whether it's an offhand insult or a gesture of competition, it will help us." But everything Weinstein said had a caveat: Sarachan is fickle and prone to unrealized projects. 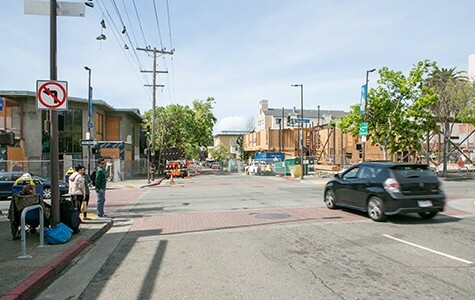 The blighted lot on Haste and Telegraph's northeast corner is now the site of a planned mixed-use building, developed collaboratively by Sarachan and UC Berkeley. And Mayor Tom Bates told Berkeleyside earlier this year of Sarachan, "Until he signs the deal, I won't believe it." Every longtime Telegraph retail worker I spoke to echoed Bates' skepticism. Sarachan's apparent indecisiveness is storied. Years before cofounding Amoeba with Weinstein, Kent Randolph responded to a job listing for store manager at Rasputin. When he showed up, Sarachan offered him a security guard position. More recently, according to employees who requested anonymity, Sarachan hired workers to operate a planned vintage clothing store in another one of his Telegraph properties. Instead, he assigned them to his basketball-themed ice-cream stand, Scoop Dreams. Such mercurial hiring practices are reflected in his grander schemes: One depressing and thankfully aborted idea for the empty lot was a "Free Speech Museum," Randolph explained to Cometbus. It's possible that some of Sarachan's proposals are just distracting gags. His design for the blighted lot's mixed-use building is gaudy, if not ridiculous: a Moorish palace-inspired structure with Pan-European archways and crests straight out of Aladdin. Still, that structure is easier to imagine than Mad Monk and Commissar, the high-end borscht joint with conscious rappers. "It's a complete joke," Weinstein said. "Numerous times along the way he's presented some absurd idea just to satisfy city deadlines." Meanwhile, the managers Sarachan introduced for the club and restaurant back in 2013 don't know what's going on. In 2013, Craig Becker, owner of Caffe Mediterraneum and president of the Telegraph Business Improvement District, was tapped by Sarachan to "help him manage the bar at night," as Berkeleyside reported. Recently, though, Becker emphasized that there was no formal commitment, writing in an email that he is "not particularly in the loop." Likewise, Scott Cameron, restaurateur behind the buzzy Guest Chef, which shuttered in 2013, told the zoning board that year that Sarachan hired him as on-site manager. Cameron recently said he wasn't sure about Commissar anymore. When asked about his ultimate role at Mad Monk, Cameron said, "I don't know that, either." Kriss Worthington, the district's city council representative, trumpeted the arrival of Mad Monk. He cited a recent lobbying effort by students and business owners to change a zoning ordinance, enabling Telegraph merchants to stay open later, as indicative of constituents' desire for a nightlife district. Worthington acknowledged that Mad Monk has been delayed, but said that the city has been accommodating. About Sarachan's Moorish castle, Worthington was confident in the plan's fruition. "The university is the biggest player in Berkeley," he said. "So that's a new factor in the equation." The thing is, even if Mad Monk and Sarachan's Cal collaboration are zipping through the development pipeline, the first stop is more destruction. According to a March 2014 zoning application, the Moorish castle project entails demolishing the adjacent building at 2433 Telegraph, which is currently Rasputin's intermittently open 25-cent media annex. A quarter century after obstructing development on the contentious lot, Sarachan appears poised to top rats and blight with rubble. Plus, Stranded moves to the former Book Zoo storefront off of Piedmont Avenue, and other news from the East Bay's robust community of vinyl retailers. Rap critic Noz and archivist 12ManRambo opened the only Oakland record shop with a Sick Wid It bin card.